Our overall health is impacted by many factors. Health starts where we live, learn, work and play. The environment we live in, access to education and healthy food, financial stability and good relationships or connections in our homes and community all affect our health. To improve the welfare of the world’s poorest and most vulnerable populations, it helps to understand the variety of factors that contribute to a person’s overall health. The World Health Organization (WHO) established a framework designed to show how all of these factors combine to affect the well-being of any given individual. This is described by the World Health Organization as the situation in which people are born, raised, work, live and age. The framework also includes a more comprehensive set of forces and systems that shape the conditions of daily life. The amount and dependability of income quite often go hand in hand with social standing and can significantly affect an individual’s health. According to the WHO’s framework, a person’s health improves as income increases. With this information, we can expect that individual to experience fewer illnesses and a longer life expectancy. Income affects other determinants of health, such as food security and housing quality. Malnutrition isn’t just about being hungry – the lack of consistent, proper nutrition can lead to a host of physical problems and opens the door to disease. If there isn’t enough income to buy or rent a home in a safe neighborhood, people may be forced to choose a less secure area. An astounding amount of evidence shows that where you live actually affects your health; leading to the next point of discussion – the physical environment. The physical environment includes air and water as well as homes, workplaces, schools, and surrounding communities. Whether these factors are high-quality or not certainly impacts your health! Having easy access to primary necessities such as affordable food, availability of green spaces like parks, and health care options also lead to a more favorable outcome. Residents of neighborhoods with low crime rates are naturally encouraged to get out of the house and be more physically active; which is certainly better for you than camping on the couch! On the other hand, neighborhoods with high crime rates are far more likely to affect you adversely, both directly and indirectly. Those with greater access to transportation options not only save time but improve their mental health by reducing stress with comfort and convenience. Walkability also plays a considerable part in one’s health. If a neighborhood actively enables the community to walk more, the need for motorized transportation is lessened. This potentially reduces both local pollution and waistlines! The physical environment can either promote or damage a person’s health, so it is essential to consider this factor when assessing a population’s health status and potential. Added to the already lengthy list of individual factors affecting your health is the Social Environment. This includes interpersonal support networks as well as broader social systems and community groups. The enormous amount of support from family members, friends, and communities has been associated with higher overall health for many reasons. Creating more cohesive communities can lead to greater feelings of empowerment, which leads to a higher level of personal responsibility for healthy behaviors. Social support enables us to deal with problems and difficult situations in our lives by providing emotional guidance, additional information and perspective, and other forms of assistance. As a rule, high-quality social networks encourage people to make life-changing choices for the better and maintain a healthy mental state. This is especially impactful for the under-privileged already struggling to overcome challenges that come with poverty. Awareness of the determinants of health allows leaders and health providers like Sunshine to address public health issues more effectively. We can all help to improve the health of everyone around us by voicing community needs and changing policies. 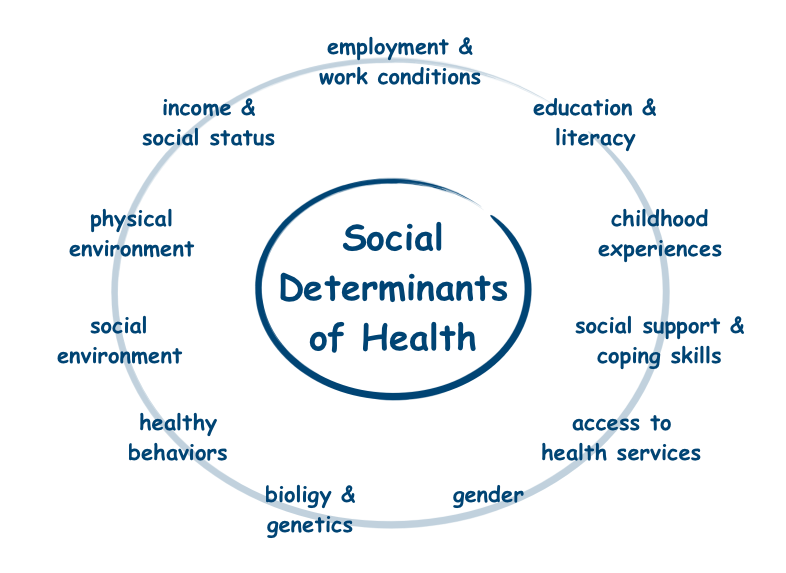 By dealing with social determinants, we reduce health inequalities, which can only improve global welfare. Sunshine offers Patient Advocacy services to help you not only navigate the healthcare system with assistance completing paperwork but they can also help you identify and connect with services that can help improve your overall health where you live, learn, work and play. Contact a Patient Advocate at either Sunshine location (Willow and Talkeenta) to learn more about the resources your community has to assist you with your whole health.